Last term, fifteen Sixth Form students took part in a course introducing them to the world of music therapy. The course was led by music therapist, Holly Dickson, in partnership with leading charity, Nordoff Robbins, whose goal is to ‘change lives through music’. The students were interested in the course for various reasons, from exploring potential career options to understanding prior experience of using music to communicate with elderly relatives. Consisting of a series of evening sessions, students learnt about the origins and ethos of music therapy, engaged in practical improvisation work to begin to see how music can have a positive impact on someone with, for example, learning difficulties or dementia, reflected on the relationship between therapist and client and explored the psychology involved. The course culminated in students working with music therapists in a variety of places, including care homes, refugee centres and special schools, incorporating sessions for both individuals and groups. It was wonderful to involve students from Chetham’s recently in some of my music therapy sessions. They were sensitive and attentive to what was happening, and we chatted in between sessions about why what they were witnessing was significant for the individual receiving therapy. It wasn’t long before I was throwing them in the deep end, asking them to play alongside students with varying learning and developmental difficulties – I think they forgave me for it though! It was great to have the students participate in my work at this care home. They were enthusiastic and keen to apply the principles they had learnt during the school-based workshops in ‘real life’ music therapy settings. 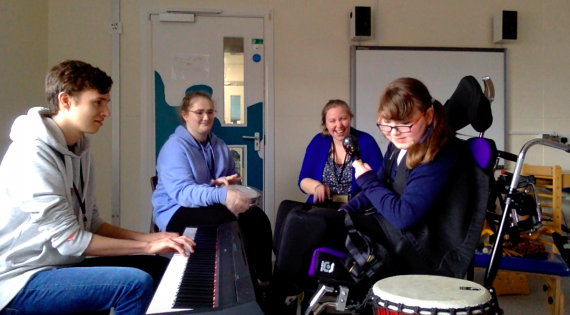 Both students eagerly took up the challenge of making music with people living with dementia in many different ways, and their presence brought exciting new musical ingredients and possibilities into the sessions! We had a great session with three youngsters who have autism; having the three Chetham’s students there was super, as they could model some solo playing! Having the Chetham’s students in school with us was great. They each brought along their own musical skills and very bravely jumped in at the deep end to make music in sessions, to my clients’ great delight! Congratulations to all the students involved!